We supply New and Refurbished Hoist, all makes. Contact us for more details. Our goal is to keep all our customers satisfied by offering a sophisticated and professional service that measure up to the highest international safety standards and quality. Ensuring continued satisfaction by employing duly qualified and professional personnel and developing a long term relationship with all customers. MLN Cranes has been established in 2008 by the owner/member Mr. H Fourie. He is a qualified LMI inspector and has been in the crane development, installation, service, support industry for over 20 years with extensive experience on various cranes and lifting equipment. Our company undertakes to measure up to all safety requirements standards set by our customers. All work is done in accordance with the ISO 9001 and we are a registered SADC exporter and have a B-BBEE status level of level 4 with a 100% contribution level. We specialize in manufacturing, maintenance, servicing of cranes and do load testing and sling inspection. We are qualified and authorized to issue certificates accordingly. 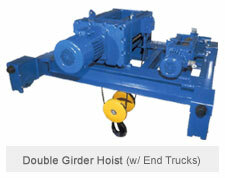 Please feel free to go through our wide selection of Crane Hoists, Rope Hoists and Electric Hoists. You can contact us via telephone, eMail or our online contact form.